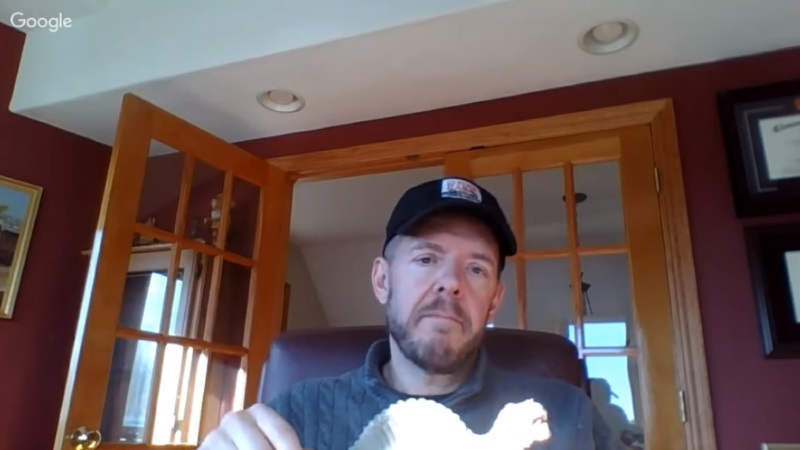 On January 18, 2018, creationist David Woetzel ("Dino Dave") was on a video interview with Jackson Wheat, a proponent of evolutionary biology and atheism. You may remember reading about Dave on this site, with a post about his personal examination of the Angkor Wat Stegosaurus carving and my review of his book Chronicles of Dinosauria. Woetzel has gone on expeditions to locate living dinosaurs. That makes sense, since he has a strong interest in cryptozoology (see "Cryptozoology & Creation Apologetics"). The video format is one-sided, probably by design, as we do not see Jackson Wheat. David Woetzel. Screenshot from the video, which will be linked below. Wheat wanted to talk about his favorite topic, evolution, and tried to divert Woetzel to other topics, which were usually refused; Dave wanted to stay with his areas of research. It was interesting that Jackson brought up the failed transitional form tiktaalik, but Dave did give him a good response with some facts that Jackson left out of his claim. The best part for me was the stegosaurus carving. Wheat gave some boilerplate evolutionary objections, but Woetzel was able to easily meet those challenges. One objection was that the carving was not detailed enough, so it must be some other animal, but we don't rightly know what. Oh, come on, it was a piece of ornamentation, not a scientific treatise. And if evolutionists have a legitimate alternative, make a case, not an excuse such as found on anti-creationist sites. Dave's explanation of some of the oddities of the carving included historical and cultural information. Seems that people tend to forget about another carving in the area, which Dave examined. A couple of short items that Woetzel brought up made me uncomfortable because they are controversial for creationary apologetics. However, some of the "do not use" lists need to be revisited, and Dave is not one of those gullible people who saw a video or read a hysterical article and got the bit in his teeth and ran with the story. No, he's a right smart fellow, and has reasons to think that the Ica Stones and the bell found in coal are not so easily dismissed. I won't use those as evidences for recent creation and the Genesis Flood myself, though. Mayhaps later. Darwinists want "hard evidence" for the possible existence of dinosaurs living with man (including in modern times), but those same folks will eat up speculations for evolution that are presented as actual science. Meanwhile, we are given weak, fallacious excuses based on ignorance and incredulity along the lines of, "We haven't found any dinosaurs, so they must not exist". This includes their waving off historical evidence, and the fact that the world is a big place that has not been entirely explored. Reports of dinosaurs are in the kinds of areas that we might expect them to live, but they are remote and dangerous places. It's been my experience, and that of other creationists, that atheists and evolutionists are locked into their presuppositions and naturalism. There was no Genesis Flood, and is no evidence for it, because atheism. Yep, that's "logic" on their world. We can present all we want, but they'll find rescuing devices online. But we keep trying, as some people will begin to use their cognating bone and begin to question evolution. We hope that they will ultimately realize the truth of creation and the Word of God. If you want to see the video (I converted it to MP3), click on Jackson's video, "Talking with Dave Woetzel". No, I don't like to embed long videos. Ever get to a site that is loaded with them? I bet you click out, just like me. Shorter ones, yes, like the one below.